My father-in-law, Ted, has a beautiful king salmon that he caught, mounted and hung in his closet. I've heard the story about how he caught that fish a few times. He likes to tell everyone that he hung it in the closet so that he can look at it twice every day — once in the morning when he gets his coat to leave, and once in the evening when he hangs up his coat. It really is a magnificent fish and I've found myself looking in the closet from time to time, thinking about the day that I might get the opportunity to catch one similar. This year that chance finally came. Ted asked me if I'd like to head over to Manitowoc, Wisconsin for a weekend of salmon fishing. I quickly jumped at the opportunity and looked forward to it for months. It was going to be a quick trip leaving Friday morning and returning Sunday afternoon with two days out on the charter, joined by my brother-in-law Zac and his friend Ndefru. We met our charter at 4:45 a.m. and headed out for our first day. It was foggy as all hell and the lake was ridiculously calm as our captain took us out about three miles and his first mate prepared the lines. This was a completely different kind of fishing than I have ever done. The crew set up all the lines with a variety of down riggers and outriggers and flashers and we trolled around for a couple of hours before the first fish hit. They had 12 lines out, and when the fish hits, one of the crew grabs the rod and hands it to you to reel the fish in. Ndefru had never been fishing before so he was the first to go. 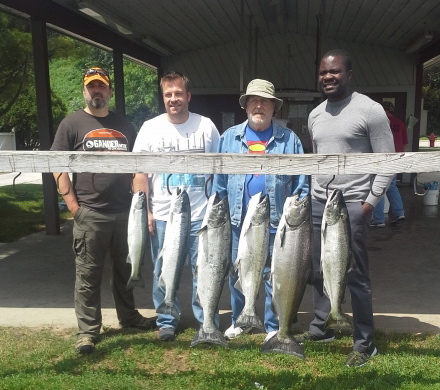 The first fish was a big king salmon that took Ndefru about 15 minutes to reel in. The captain guessed the weight between 17 and 18 pounds and we had our first fish of the day. Shortly after that, I was up and reeled in a five-pound rainbow trout — not as exciting as a king salmon, but a nice eating fish. Sadly, that was the end of the fish action for the day. We trolled around for four more hours and got nothing else. Day two was a much nicer day, with a good breeze and a clear sky. It didn’t take long after the first lines were set out for the first fish to hit. Zac got into a nice salmon and then Ted got one soon after. 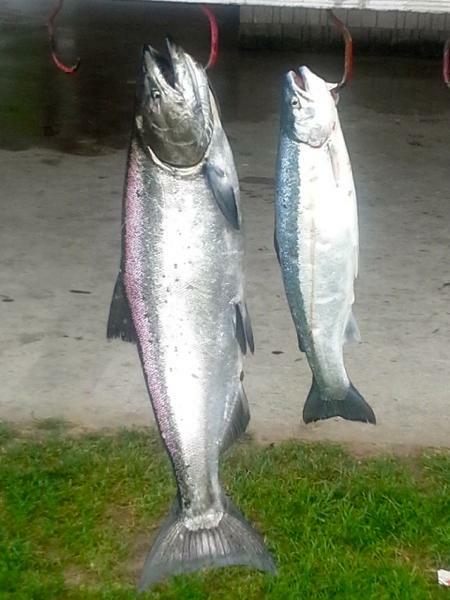 I got another rainbow and Ted and Zac got a couple of really nice salmon, Zac added another small rainbow for good measure and then the bite was over. We spent a couple more hours trolling around but got nothing else. Back at the marina, the captain filleted all our fish and asked how we wanted them done. I asked for all of the backbones from the salmon and Ndefru took the heads and some of the roe sacs. Each one of us got to take home a beautiful bag of salmon fillets and a few rainbow trout. We may not have caught our limit in fish but I thought the trip was a success. It was nice to see my father-in-law reliving some of his old memories and the look of pure joy on his face when he landed another beautiful salmon. As soon as I got home, I was really eager to give the salmon a try. I took one of the backbones and scraped all the meat off with a spoon. A lot of people don’t realize how much meat is left on a fish after it is filleted. I got a little over 11 ounces of meat off of one backbone. This was just enough to make some beautiful salmon burgers. I almost can’t wait to get back over there next year and see if I can’t catch my first salmon and maybe even a trophy to hang in my closet. Combine all the ingredients and let stand in the fridge for 30 minutes or so. Form your patties and cook on medium high heat for about 2 minutes per side. This can be done on the grill or in a frying pan. 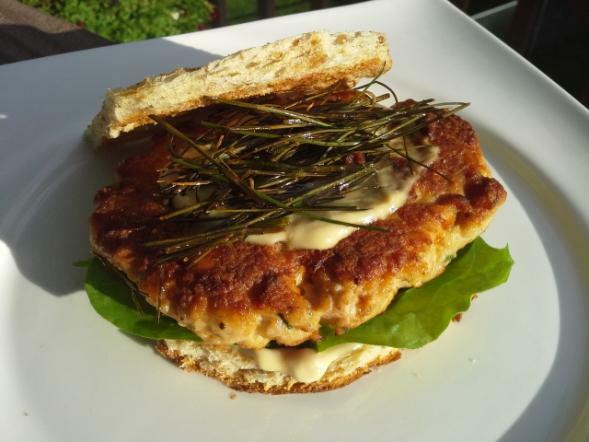 I served mine with some sorrel leaves fried chives and a wasabi mayo and it was perfect. Stir to combine and let sit in the fridge for 30 minutes before using. Jamie Carlson lives in Burnsville with his wife, Amanda, and their two kids, Eleanor and Charlie. 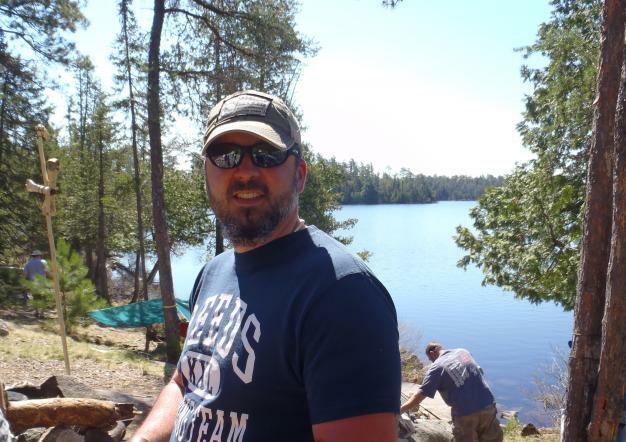 He works as an RN at the Minneapolis VA hospital and enjoys hunting, fishing, foraging, and of course, cooking. He believes that all food can be tasty if it's prepared with care, and he writes about his adventures cooking everything from pickled venison heart to roasted dove on his food blog, You Have to Cook it Right. Follow him on Twitter at @youcookitright.